The StoneFly ValueSAN™ product line delivers the ultimate in scalability and advanced features at an incredibly low price. Based on the extensible StoneFusion® 4.0 OS, Storage Concentrator® i3000 delivers best in class flexibility and performance to deliver the best value over time so the IP SAN can grow along with your needs. Starting at 960 GB and scaling to 19.2 TB in a single node, the IP SAN also scales by adding Storage Concentrator nodes. Key features include advanced storage management functions, such as synchronous mirroring through StoneFly Reflection and StoneFly Snapshot. Complete with the StoneFusion OS, ValueSAN provides storage provisioning to present SAN storage to hosts as local disks. ValueSAN storage arrays come with an abundance of high-reliability features, including advanced sub-array support with true RAID data protection built with the latest Serial ATA high-speed disk drives. To provide enterprise-level performance, StoneFly also offers a wide range of software and hardware options, such as Continuous Data Protection, D2D Backup and FailOver. The ValueSAN line brings unprecedented scalability to your IP SAN. Each StoneFly ValueSAN node supports from one halfpopulated array up to four RAID arrays and provide data recovery and business continuance support, such as mirroring and Snapshot. The StoneFly IP SAN scales by adding both storage per node and number of additional Storage Concentrator i3000 nodes. 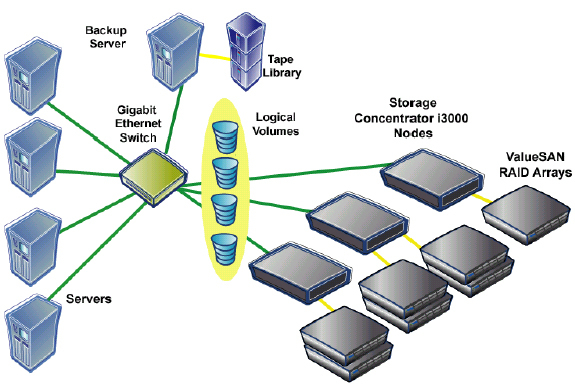 StoneFly ValueSANs include Storage Concentrators and advanced RAID storage from a single source provider. StoneFly ValueSANs are designed to give you a simple, intelligent and affordable entry to the benefits of storage networking that grows over time. StoneFly ValueSAN nodes start with one array populated with either six or twelve drives. Add a six-pack of drives or additional arrays one at a time or in groups to scale capacity easily and quickly. You can even start with one size drive and add a larger capacity six-pack when you want to upgrade. The ValueSAN line grows as you grow with advanced software features as well, delivering the best value over time.